On December 31, 1934, Helen Richey became the world’s first female pilot to fly commercially on a regular scheduled mail route. Back then, it was extremely rare to find a female in the front seat of an airplane, and surprisingly enough, not much has changed in the past 82 years. According to the FAA database, there are about 617,000 qualified pilots in the United States, of that, only 41,000 are female. If you look at commercially rated pilots versus private pilots, the numbers get even smaller; 3% of the commercial pilot group are female. Here at Silverhawk Aviation, our numbers aren’t quite as desolate! 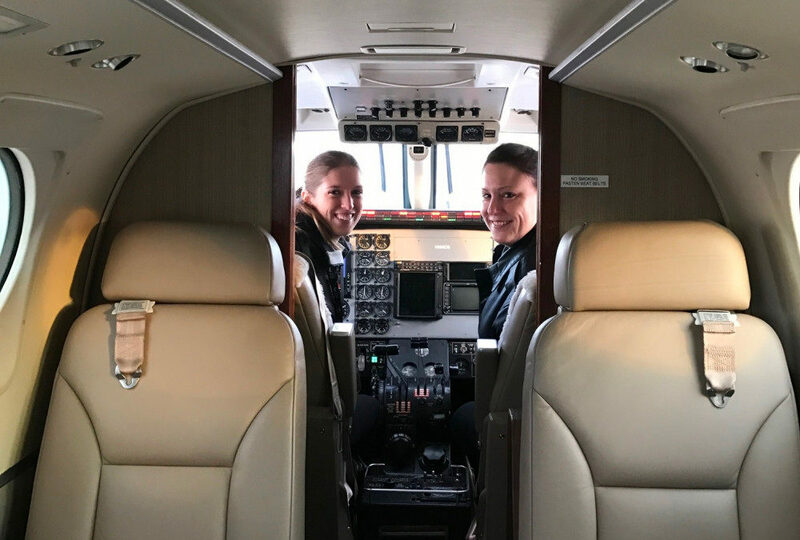 Of our 25 pilots, we have 3 female pilots who would love to take you to your next destination! Shown in the picture, we recently had our first ever, all-female crew on a trip to Western Nebraska. Tristan Van Nocker has been with Silverhawk Aviation since 2010, and has recently upgraded to captain in the King Air 90. Marla Stephen, who also flies the King Air 200 for the Army National Guard, joined our team in May of this year. There has been a lot of growth at Silverhawk this past year, and it is exciting to welcome pilots from many different locations, both male and female. This won’t be the last time these two will be in command of getting you to your destination safely. Next time you happen to see one of our great female aviators, be sure to congratulate them on being part of the 3%.